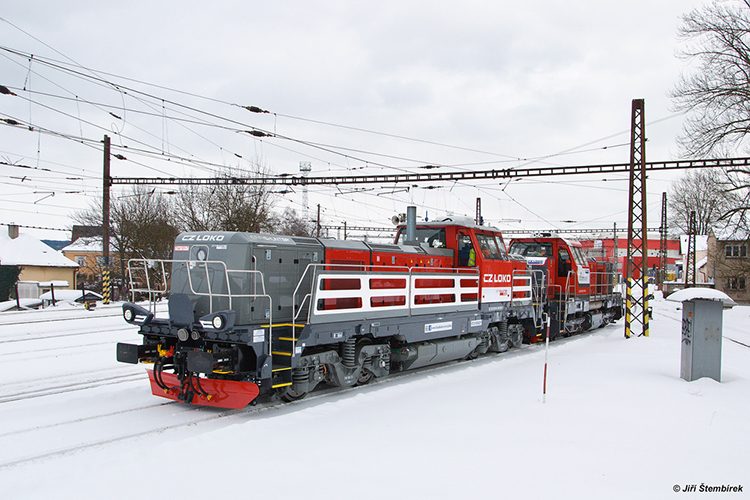 2012 was the year CZ LOKO presented its concept for a new medium power diesel locomotive for shunting services and mainline operations up to 120 km/h. Pre-series locomotive 744 001 made its national debut at the Czech Raildays in June 2012. In September it was presented to the worldwide railway industry on the InnoTrans trade fair in Berlin. The 744.0 series can be delivered with two different off-the-shelf Caterpillar engines, resulting in power ratings of 1.000 and 1.500 kW respectively. It is possible to equip the locomotive with engines between 700 and 1500 kW if desired. The locomotive is designed for operations in various Central European countries, such as Austria, the Czech Republic, Germany, Hungary, Poland and Slovakia. In 2015, the Czech manufacturer remarketed its 744.0 locomotive as the EffiShunter concept. The EffiShunter is an updated version of the original 744.0 and is available in both 1435 mm and 1520 mm versions. Next to minor changes in the design and dimensions of the locomotive, the 1435 mm version of the EffiShunter houses a Caterpillar C32 engine to meet the European Stage IIIb emission requirements. The EffiShunter concept's designed interoperability has not changed compared to that of the 744.0.